I do find it amazing how at the start of any relationship things start off a bit rocky. A colleague at work and I used to knock heads a lot at the beginning. It turns out that we do have much in common and the differences are well just differences. Anyway, I have never been to Cornwall. I am told it’s beautiful there and you can get authentic things such as cornish pasties and various other things. 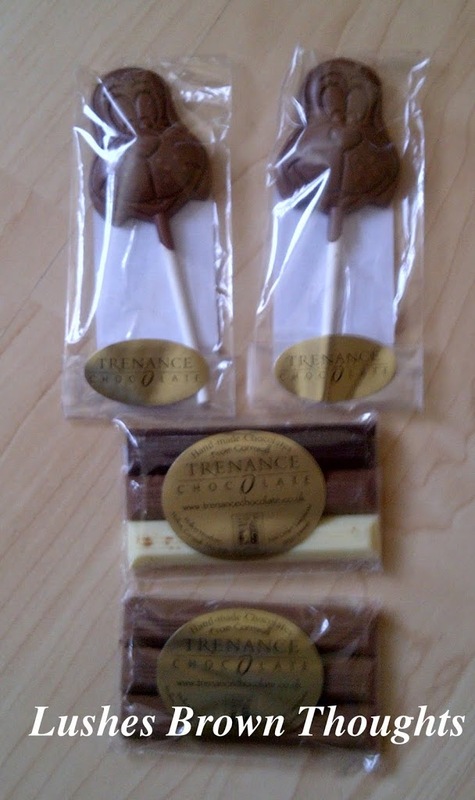 I had the pleasure to be given from my workmate a selection of Trenance Chocolate all the way from Cornwall. She was so thoughtful to get the boys chocolate lollipops with the cartoon faces.The remainder two bars was for me to share with hubby. He does not eat treats that often so I decided I would enjoy them myself. Yummy they are gorgeous. Not too heavy and just smooth. The white chocolate was amazing. I might visit Cornwall one day just to get more.